Retirement is on people’s minds, but for most, it’s a far off goal even if they are older. Too many people wonder if they can retire when they want to, but aren’t sure how to check. 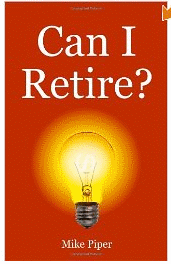 Last year I received a copy of Mike Piper’s Can I Retire? from Mike himself. Besides being extremely knowledgable about investing, he was a really sweet guy. He’s genuine and he wants to help others with their investments through his books and his site The Oblivious Investor. If you’re on the fence on whether or not to pick up this book, here’s my review. What if 4% Isn’t Enough? While it appears from the chapter titles that this book may be a long, it’s actually quite concise. Mike tends to format his books to cover a very specific topic in about 100 pages or less. For those looking at getting a grip on their retirement, this is the perfect book to start off with since it discusses and defines the terminology an math behind retirement easily. If you’re looking at a quick book to reference for an answer, check out this book. For those looking at digging deeper with investing, Mike and I both recommend The Bogleheads’ Guide to Retirement Planning.